When investing in a new instrument, you want to know that it's designed with a mutual balance of beauty and functionality, while being environmentally conscious. At Bachido, we're always focused on making the shamisen more accessible and sustainable in the world, which is why we're proud to present the Sakura Shamisen. The Sakura Shamisen (a.k.a, ‘Sakura’) is the first professionally-made shamisen to be designed for the consideration of both players and the environment, while maintaining the highest standards for quality. Let’s find out why! Despite the prized shamisen wood (kouki) facing extreme endangerment, there has been little effort to use environmentally friendly resources. Most makers still insist on kouki for the reason of “preserving tradition”, even though the use of kouki started only 40~50 years ago! At Bachido, we strongly believe that using sustainable woods offers great quality, beauty and peace of mind. A push for ethical resources will benefit the future of shamisen, shamisen enthusiasts, and the world in where we make our music. All with no loss of quality. The Sakura Shamisen is the first of it’s kind to be made with Purple Heart, a water-resistant wood that is strong, beautiful and abundant. This instrument is made in Japan by one of the best shamisen makers in Tokyo, who is famous for making the best sounding dou (body). So when you play a Sakura Shamisen, you know you are getting the richest tone while supporting a sustainable future for our beloved three-stringed rocking machine! When tsugaru shamisen started regaining popularity in the 70s, a few successful players had their shamisen custom-made with thicker necks for the image of a masculine instrument. Once this aesthetic became popular for shamisen players, the neck became thicker and thicker, so much that nowadays, some professional players will move their strings closer together, not even using the full width of the neck. 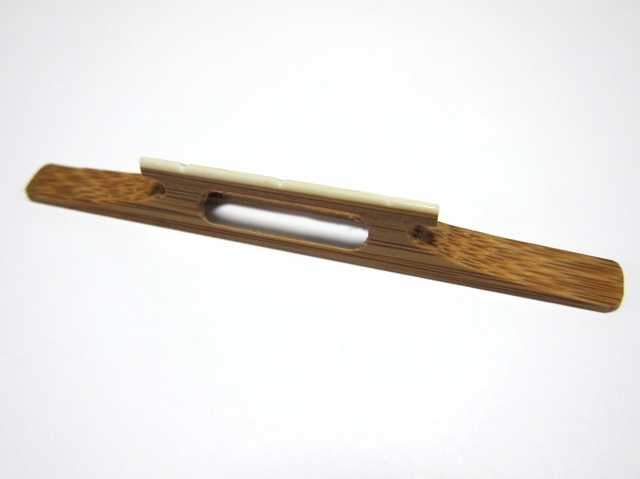 For the Sakura Shamisen, we take a step back towards functionality by consciously building a thinner neck. When I started the tsugaru style, I unquestioningly believed that ‘bigger is better’. Thicker strings, a wider neck, larger body, it all went towards the direction of “good.” As I improved over the years, I too found myself putting the strings closer together to play more comfortably, and then started to question this belief. If I don’t even use the full width of the neck, isn’t extra weight and wood hindering my abilities? You can imagine how thrilled I was when this new shamisen was released. When I usually play a new shamisen, it takes me a few minutes to get comfortable. When I picked up the Sakura Shamisen, my hand instantly felt united with the thinner neck, and executing all techniques felt so easy and sounded clear! To help you get started with your brand-new Sakura Shamisen, I am including several learning materials for free! Note: A Bachido membership (free) is required to access the courses. To unlock the courses, please contact Bachido after ordering the Sakura Shamisen. Include the full name on your Bachido account, as well as your paypal receipt for the Sakura Shamisen. After your account and purchase has been verified, the courses will be unlocked to your account. Includes one Ichi no Ito (2X), a pack of three Ni no Ito and a pack of five San no Ito. The Neo is the tailpiece which the strings are tied to. It is fitted on the end of the shamisen. The Dou Gomu Shi-ru is an adhesive rubber pad which is affixed to the lower-right corner of the dou (where the dou rests on your knee). Without it, the shamisen can easily slip off of your leg while you’re playing. The hardest part of shamisen playing is the lack of frets, or other indicators to where the positions are. 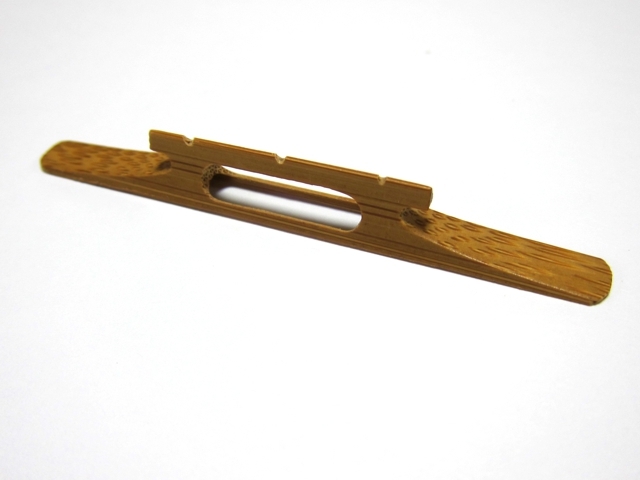 The fujaku is an adhesive plastic strip which sticks to the side of the shamisen. When placed correctly, the numbers on the seal line up exactly where you need to press the string to sound the desired position. This seal takes away lots of frustration from your shamisen experience. It can be removed when your fingers attain muscle memory so you don’t need to look at the numbers. Watch how to attach a fujaku. 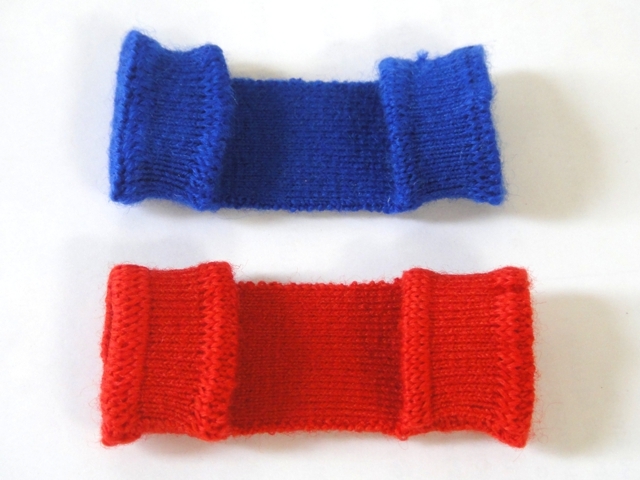 The yubikake is a tightly knit sleeve which is fitted over the index finger and thumb. When playing shamisen, the friction of your skin rubs against the neck, making it hard to play. 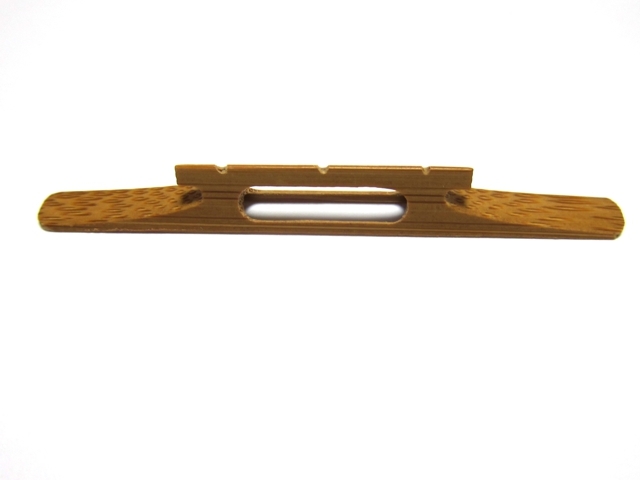 The Yubikake adds a layer between your hand and the neck, reducing friction and making playing much easier. Neighbors keeping your sound levels down? Desperately wanting to play shamisen now but still recovering from that hangover? The shinobi koma (Stealth Bridge) is made for you! Replacing your normal koma with the Shinobi Koma will lower the sound level tremendously. Note: Though the sound from striking the string is significantly reduced, the percussive sound from the bachi snapping against the skin isn’t affected by the koma. Prepare for extra-awesome! This Shinobi Koma is loaded with extra features! 1) Unlike the Shinobi Koma (Standard), the Shinobi Koma (Deluxe) is shaped in such a way that you can freely execute maebachi and ushirobachi techniques without being constrained by the size of the koma. 2) Though the Shinobi Koma (Standard) mutes the sound from the string, the loud percussivness of the bachi striking the skin remains at full volume. The Shibobi Koma (Deluxe) reduces the percussive volume as well as the volume from the strings, providing a satisfying and balanced low-volume experience. 3) The timbre of the (muted) sound quality can be adjusted. Please be aware that Bachido is NOT responsible for covering import tax, and must be covered by the customer. Because import tax varies depending on the country, please check your country's import tax and make sure you will be able to cover the cost of the tax as well as the items you are purchasing from Bachido. There is a 90 day return policy (which starts on the first day of shipment) for the Sakura Shamisen. All returns are subject to a 15% restocking fee, and shipping costs must be covered by the customer. 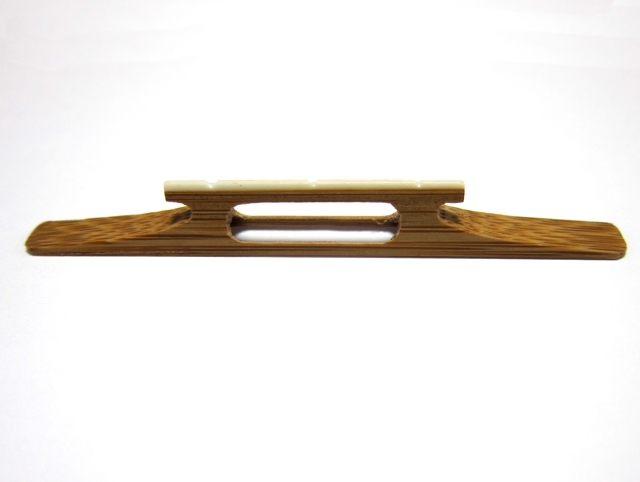 We stand behind the quality of our shamisen with the highest standards. The Sakura Shamisen is made by the best maker in Japan and skinned with the highest quality skin in Japan. Thus, we will not accept "lack of quality" as a reason for return. Please be certain that you are ready to invest in the Sakura Shamisen before purchasing. The Sakura Shamisen must be returned in new condition. Any signs of wear or damage to the instrument, whether from use or during shipping, will void the warranty. If this is the case, we will provide evidence of the fault, and the refund will not be given. If this is the case, the customer must cover shipping costs to have it sent back to his/her address. The Sakura Shamisen is fully insured from initial shipment to until final delivery. If the Sakura Shamisen is damaged upon arrival, please proceed with the following instructions to receive compensation/replacement. The skin of the Sakura Shamisen is guaranteed up to 6 months (starting from initial shipment). We will only request shipping costs to be covered by the customer. If the skin ruptures before then, please proceed with the following instructions to receive skin replacement. 3. When we confirm the your Sakura Shamisen is covered for skin replacement, we will tell you the address of where to send the Sakura Shamisen dou (body) for skin replacement, and will request a specified payment to cover costs of return shipping. 4. Please watch this video to learn how to remove the dou (body) from the Sakura Shamisen Watch how to remove the dou.